In a nutshell, wet felting is the process of combining layers of wool roving and/or wool yarns into one flat piece of felt fabric, that can then be used to create any number of things. 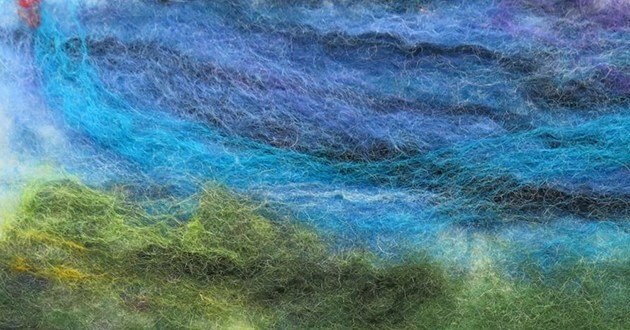 In this class we will be going over the basics of wet felting, the techniques, and varying ways that you can turn roving into a finished product. Get ready to get a little messy*, and have a lot of fun! Cost is $30 total: $20 class fee, plus an additional $10 materials fee, payable to the Instructor the day of class. Minimum 3 students, maximum 8 students. If the minimum number of students is not reached, the class will be cancelled and a refund issued. *An apron or smock is an optional item you may want to bring with you to class to protect your clothing. There are a limited number of aprons available for use in the Craft Box Classroom if you would like to borrow one of ours during class time.